U.S. President tweets copy of letter he received from North Korean leader following their summit last month. U.S. President Donald Trump on Thursday said North Korean leader Kim Jong Un sent him a “very nice note” on future relations between the United States and North Korea. “Wishing that the invariable trust and confidence in Your Excellency Mr. President will be further strengthened in the future process of taking practical actions, I extend my conviction that the epochal progress in promoting the DPRK-U.S. relations will bring our next meeting forward,” the letter read. 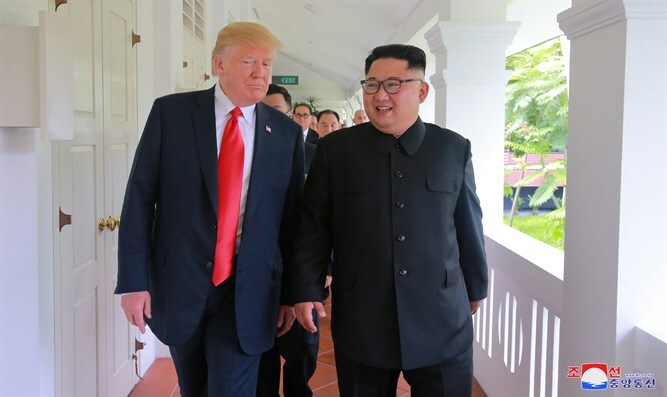 Trump and Kim held a historic summit in Singapore last month in which they signed an agreement including a commitment to achieve total denuclearization of Korea, with promises to pursue “vigorous negotiations” to that end. Last week, however, North Korea accused the U.S. of making “gangster-like” demands in negotiations, in a statement issued following Secretary of State Mike Pompeo’s visit to Pyongyang. On Monday, Trump voiced confidence that Kim would “honor” his commitment to denuclearize. “I have confidence that Kim Jong Un will honor the contract we signed &, even more importantly, our handshake. We agreed to the denuclearization of North Korea. China, on the other hand, may be exerting negative pressure on a deal because of our posture on Chinese Trade-Hope Not!” he tweeted.